67% of people say that they are unsatisfied with their double chin and want to seek cosmetic treatment. As we age, our bodies natural collagen productions decreases and skin around the neck and face may begin to loose elasticity. Many things can contribute to the appearance of a double chin and it’s often resistant to diet and exercise. Now there’s a non-surgical, long lasting solution: Kybella™. Annapolis facial plastic surgeon Dr. Bryan Ambro provides Kybella for a nonsurgical alternative to chin liposuction. With years of experience and a carefully trained aesthetic eye, Dr. Ambros can use Kybella for effective and natural looking results. Dr. Ambro is a double board certified facial plastic surgeon who specializes in aesthetic and reconstructive surgery of the face, head, and neck. Kybella is an FDA-approved non-surgical treatment to reduce the appearance of a double chin. We are pleased to offer this new facial contouring treatment in our Annapolis plastic surgery center. In a 15 to 20-minute treatment session, Dr. Ambro will contour the fullness below the chin to smooth the neck for a younger, healthier look. The active ingredient in Kybella, deoxycholic acid, actually destroys fat cells. Once destroyed, those cells cannot store or accumulate fat. Dr. Ambro will customize treatment for each individual patient. Most patients will require 2 to 4 treatment sessions, spaced 4 to 6 weeks apart but will be determined by your cosmetic goals. Once the desired results are achieved, re-treatment is generally not necessary. Men and women can both benefit from Kybella treatment. It is best suited for healthy patients with noticeable submental fullness who don’t need or don’t desire surgery. A double chin is difficult to eliminate, even with diet and exercise. Kybella effectively eliminates the layers of fat below the chin to create a younger, more fit appearance. The most common side effects of Kybella include swelling, bruising, pain, numbness, redness, and areas of hardness in the treatment area. These side effects generally subside after several days after treatment. Dr. Ambro will help determine if Kybella is right for you. 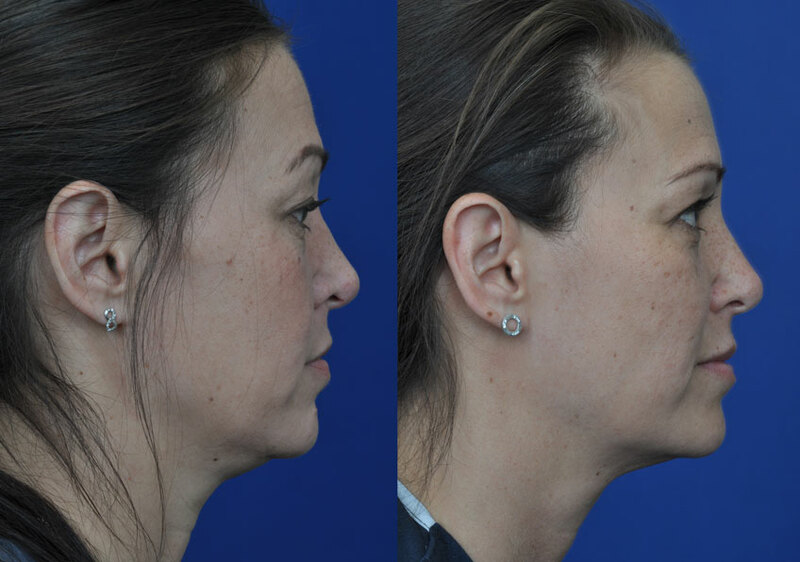 Female patient with stubborn diet and exercise resistant submental fat corrected with 2 kybella treatments.